How well do you know our secretaries? 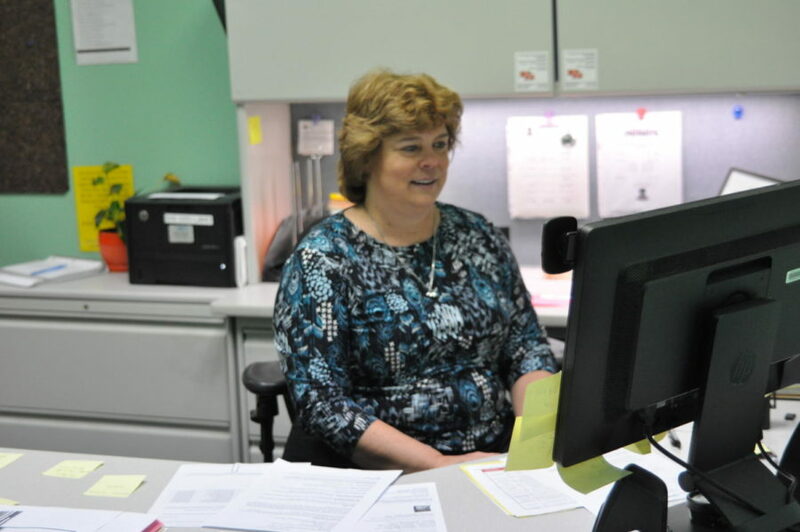 Susan Losby works on an email during the school day. Losby assists Assistant Principals Angie Pappas-Muyco and Darryl Diggs. With a school as big as South, do you really know how much work goes into keeping it running and how critical their work is to our school’s environment? Almost all the events planned, substitutes provided, and just daily life is run by our secretaries. While only two secretaries are quoted in this story, South has many more who help run the school. They work in numerous capacities, including working with assistant principals, in the counseling loft, the copy room, bookstore, library and other places. Assistant Principal Darryl Diggs said he believes secretaries are invaluable. “If it wasn’t for the administrative assistants and their work and their care for our students and the community and the building, it would make this job that much harder,” he said. Ganninger is an office worker. She said she believes secretaries don’t get enough credit for the hard work they do. “No, I don’t think enough. I think the secretaries do a lot more than they’re given recognition for,” she said. Secretary Susan Losby works for two assistant principals–Diggs and Angie Pappas-Muyco. This means she has extra work on top of her extra activities. She commented on some of her duties. “I do all the substitutes in the morning. We have anywhere from one substitute to 22-23 a day. I help call students down or help with projects secretaries are working on. I also work with 650 kids and assist them with anything they need,” Losby said. Diggs also commented on all the hard work Losby does for him and the school. “She does everything. She comes in early and makes sure we have substitutes for teachers who may be out sick or they are going to a conference or training; she makes sure that there is always someone in the classroom. She works with two alphabets worth of students for their discipline and attendance. If there is information that needs to go out she coordinates that and that is just the tip of the iceberg. She also works very hard on Parent-Teacher Conferences or people that need to come into the building. She also does work with testing like the EOC. She has a lot going on. I’m not describing everything she does and how accurately but I know she does a lot,” he said. Diggs also said he and Losby work well together. Like Losby, Laura Hill is also a secretary. She works with Principal Patrice Aitch in the main office. “I think some kids are aware but I believe that at this age that students have a lot going on so sometimes it’s hard to beware of what’s behind the scenes. I will say that every secretary or administrative assistant in this building works very very hard,” she said. Despite all of the secretaries working “behind the scenes” and the hardest at South High, it could be argued that many students do not take the time to learn who they are. Diggs said they deserve to be heard and given enough respect and recognition. “Each administrative assistant has their own story that is worthy of being heard. So whenever you see one of our administrative assistants, say ‘good morning,’” he said.